An exciting year lined up for 2017 with top fuel driver Mike Pelrine and team get back to the tracks for another mind-blowing season. Top Fuel Nitro Harly racing at its best, team based out of Fort Saskatchewan, AB. 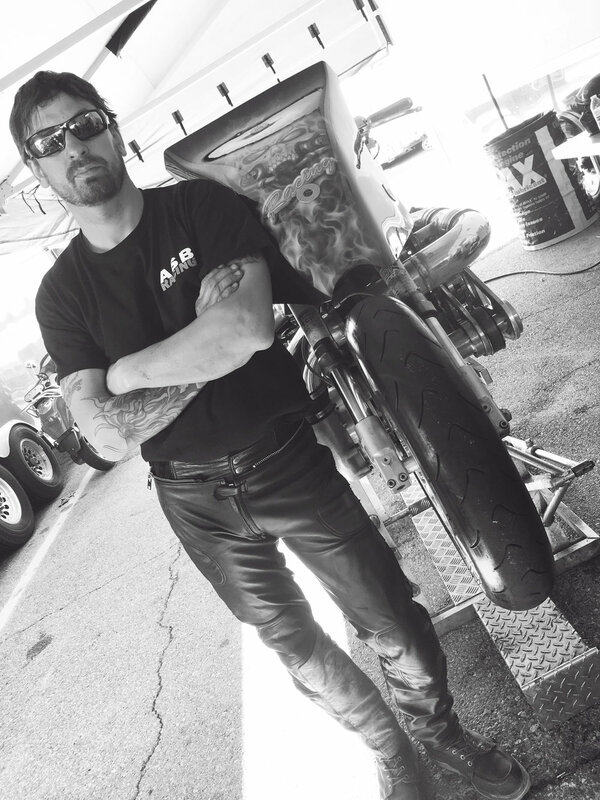 Mike joined CMDRA (Canadian Motorcycle Drag Racing Association) in 2007, licensing first on super-gas and in the same year also licensing pro-drag. Then moved to pro fuel at the end of 2008. In 2009 Mike excelled in this class by fast becoming a member of the "200 MPH - 6 SECOND CLUB" early in the season. His fastest ET was 6.80 at 203 mph, setting 2 new track records in Gimli, Man. He held title for CMDRA Pro Fuel champ 2009 & 2010 during which time he set 1/8 and ¼ mph records in Canada and ¼ mph record in the US. In 2011 Mike moved up to the Top Fuel Nitro Harley class, and ended his season that year with a ground shattering personal best run of 6.257 @ 225mph making that the fastest ¼ pass by any Canadian on V Twin to date! 2012 saw the team venture south for the season to run against some of the fastest competition in the world. Just being there wasn't enough to make the show at these big events, the boys had to battle their way up the qualifying ladders every Saturday to make it back to the lanes on Sunday. We're proud to say that after a long busy season Mike came in 5th place overall by a mere 3 points from fourth. 2013 we were back on our side of the border, as last season was certainly an experience no one regrets, but with a busy work schedule and a young family, Mike and team will stay a little closer to home. In 2014, Mike Pelrine,and crew chief Don Newlove, took on both the NHRA and IHRA circuits! We had lots of runner ups and a few wins, to claim the 3rd spot in the NHRA podium, and a respectable 5th place for the IHRA. They raced a totally of 25 events in one season!! That’s a lot of drag racing folks! We had a lot of amazing runs, having over 90% of our passes in the low 6 seconds and 220 mile per hour! Over the 2015 and 2016 seasons we began testing on our new, one of a kind, super charged top fuel Harley. This bike was a design and build by our very own crew chief Don Newlove. It has shown a ton of promise to go where no one else has gone before. Unfortunately, due to the decline of the Alberta economy we where unable to fully participate in the race seasons. Luckily though we’ve found ourselves in a position where we can again test our talents and a little good fortune on the track. It’s every drag race teams dream to be the fastest, break new records, and push the limits. We are no exception. 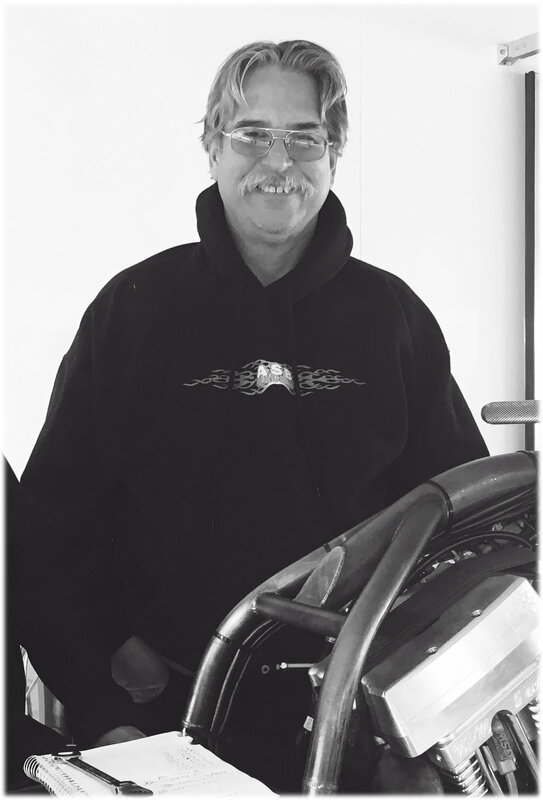 Ray has always loved bikes and racing and owned his first nitro bike back in the 80's. In November of 2006, Ray and son Mike flew to Las Vegas with John Black, of Time Machine, to take in a weekend of nitro bike racing, and his passion for the sport was renewed. Ray purchased a pro-drag and a super-gas bike, ordered himself and Mike suits, and in May of 2007, joined CMDRA, and under the direction of John, they jumped in the seat. Mike licensed almost immediately and moved onto the pro-drag. Younger son Devin decided he liked the new toy, so Ray gave it up to him. By the end of the season, Ray's younger brother Craig decided he wanted to play too, so another bike came in. Devin moved to pro drag, Craig took over super-gas, and with the help and knowledge of John Fyfie, took 3rd place in super-gas and modified. Mike moved to pro-fuel and spent a year under the wing of veteran racer and champ, Andy Beauchemin. He took the championship in CMDRA 2 years in a row, 2009 and 2010 (thanks to the unending time and dedication of our new team crew chief, Pete Burke and Mike's wife and part of pit crew, Sue Pelrine. They broke records both here in Canada and in the United States. Needless to say, these boys are naturals and have all exceeded even our expectations. We want to extend our appreciation to our sponsors and all of those who helped us along the way, past and present, especially the crews behind the scene, Dave Pelrine, Ross Perro and Tyler Benoit, who put in countless hours helping out in the shop, and many others who chipped in when they could. Thanks to the love and support and tolerance of the wives and families who keep the team watered and fed, and cheer them on, rain or shine! We strive to make our sponsors, fans and supporters proud to be a part of us and hope to have continued success for years to come!